The William D. McDowell Observatory in DeKorte Park begins a new month of programming on Monday night. Free public access is from 8 to 10 on Monday and Wednesday nights this month — weather permitting, of course. 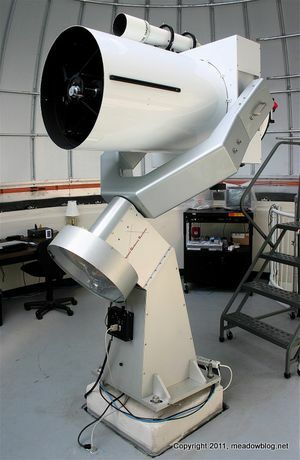 For a recent South Bergenite column by the NJMC's Jim Wright about the observatory, click here. What You Might See in April…. 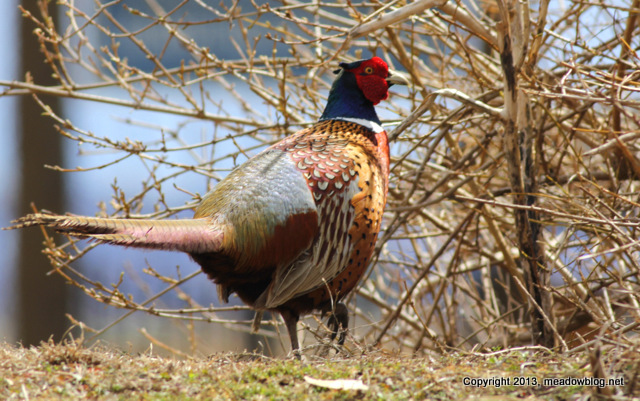 We saw this Ring-necked Pheasant Thursday afternoon, hanging out at the entrance to DeKorte Park. Photographed him from a vehicle so as not to flush him. We saw the Red-necked Grebe on Thursday morning — it was once again providing passersby insanely wonderful views. West Hudson Park itself is a nice little oasis iotself — thought we'd provide a photo so you get a feel for the place. To get to park, click here and then enter where you are coming from. 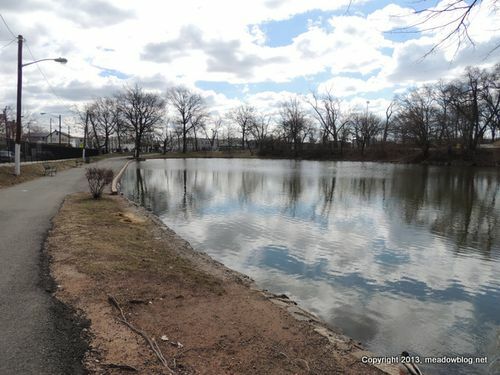 Park in lot on left, and walk under bridge to pond where the grebe has been seen. We have not had any new submissions from photographers, so this is just a head's up that next Monday's "Photography Showcase" is a bit amateurish compared to the excellent photography we have had thus far. We apologize in advance, and hope no one's feelings will be hurt. Ron Shields of Kearny photographed this Osprey eating a fish dinner on March 17 of this year. 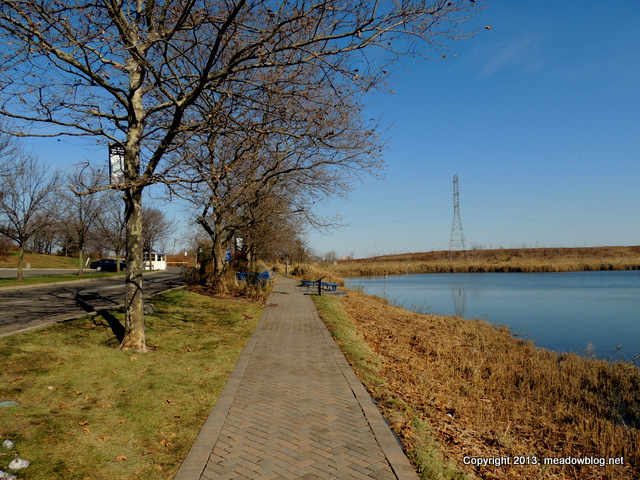 Jim Wright, who keeps this blog for the Meadowlands Commission, also writes a twice-monthy column for the South Bergenite. 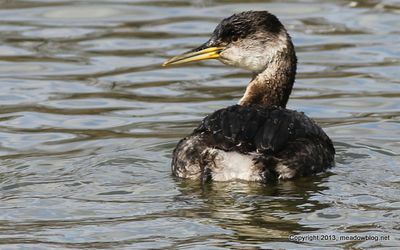 Here's his latest, on Ospreys. 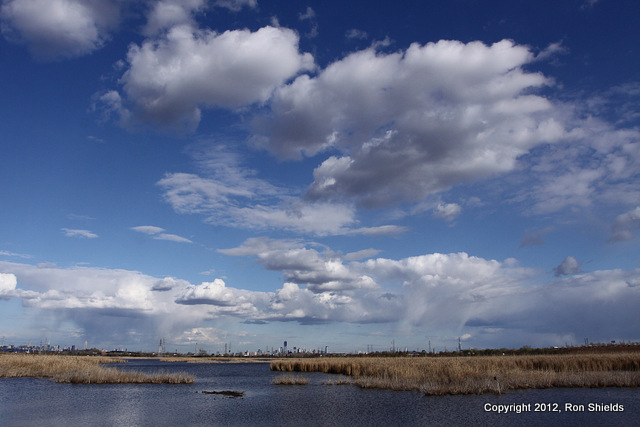 For bird-lovers, there are four guaranteed signs of spring in the Meadowlands: killdeer, tree swallows, great egrets and ospreys. The killdeer arrived near DeKorte Park in Lyndhurst in mid-February. The tree swallows followed suit two weeks later. On Saturday, March 16, came the first great egret. Then, last week, came perhaps the best news of all. 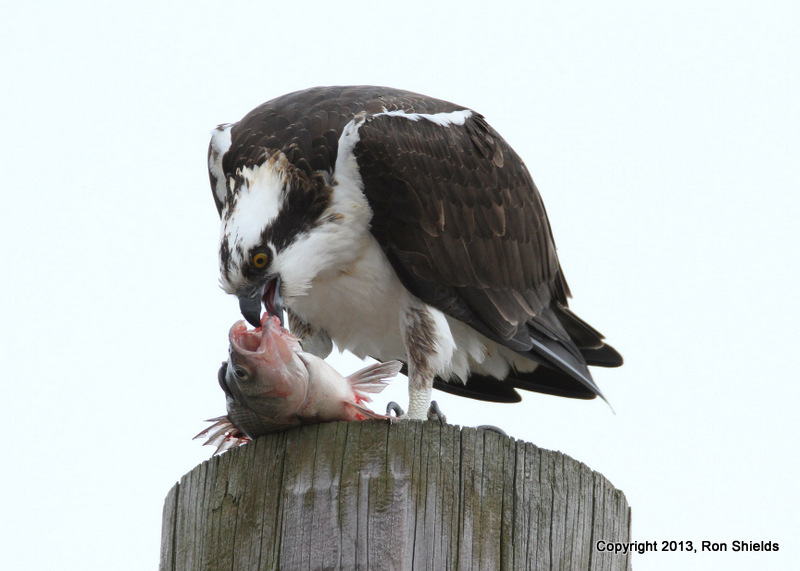 Photographer Ron Shields e-mailed me to say that he had seen his first osprey of the year – eating a fish on top of a pole on Disposal Road, not far from DeKorte Park. 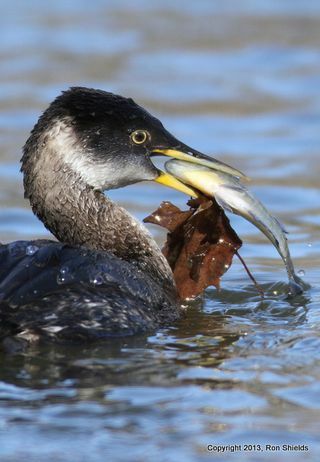 Ron’s comment: “I believe that's a white perch on the menu.” [See the accompanying photo]. As far as we know, this particular osprey did not stick around. 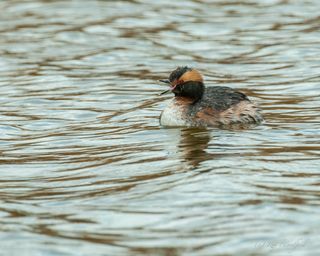 But several sure did last spring, including a pair that successfully nested on a nesting platform on Berry’s Creek along Valley Brook Avenue. It was the first time in several decades that ospreys had successfully nested in Lyndhurst. 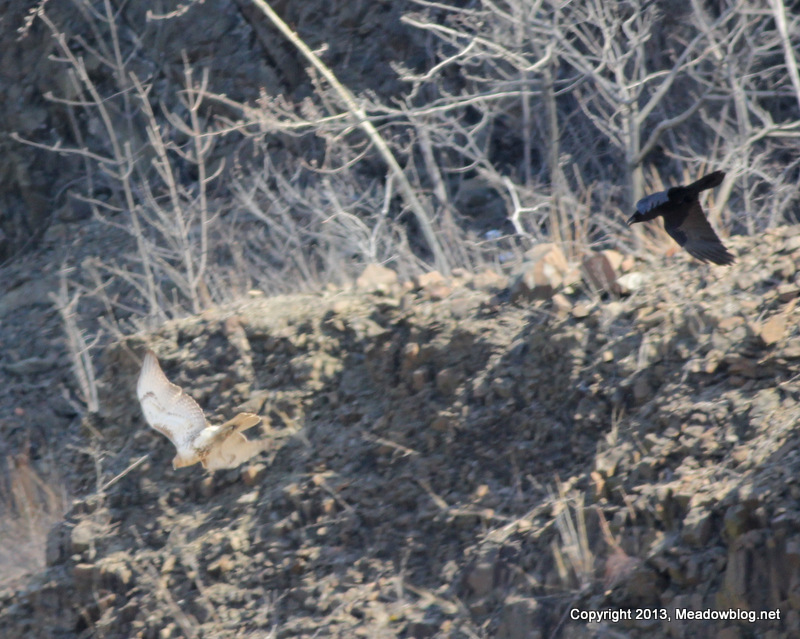 We stopped at Laurel Hill last week to see how the Common Ravens are faring. We arrived at the ballfields below the nest site in time to see a raven chasing a Red-tailed Hawk across th e cliffs and out of sight. 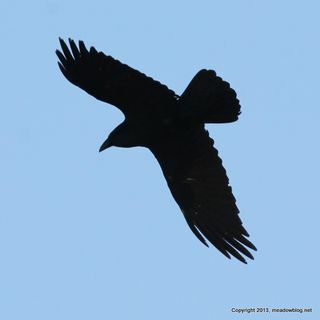 As we turned to look at the nesting site, the other raven left the newly rebuilt nest and flew overhead on its way to feed. Last spring, Peregrine Falcons likely prevented the ravens from nesting. Last fall, Hurricane Sandy washed away the nest altogther. A photo comparison of the nest site from last November and last week follows. "What a great day … and great weekend. "Our new friend seems to be getting used to having cameras pointed at him. He's been surrounded several times and he doesn't seem to mind our presence very much. 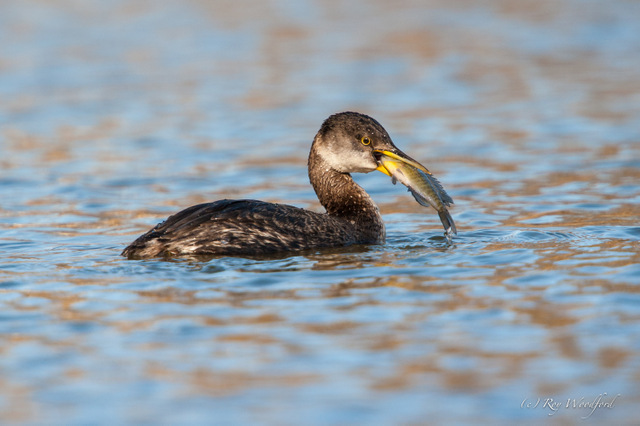 "Ron [Shields] and I got some good shots this morning of the Red-necked Grebe fishing. 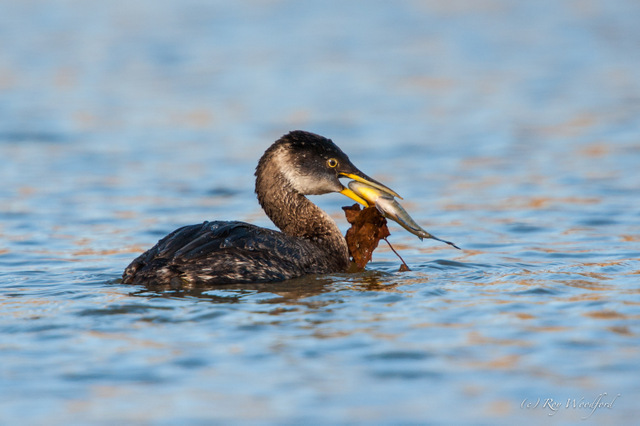 "He battled with a 6-inch bluegill for a few minutes … losing the fish several times in the process … but, in the end, he did get his meal."